Federal University, Dutsin-Ma (FUDMA), School of Basic and Preliminary Studies (SOBAPS) Preliminary and Remedial Admission First [1st], Second [2nd], Third [3rd], Fourth [4th], Fifth [5th] and Sixth [6th], Seventh [7th], Eight [8th] and Nineth [9th] Batch Admission List for 2018/2019 Academic Session Out. The Federal University, Dutsin-Ma (FUDMA), School of Basic and Preliminary Studies (SOBAPS) Preliminary & Remedial studies admission list for the 2018/2019 academic session has been released. 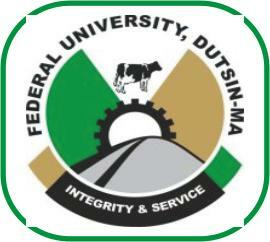 The Federal University Dutsin-Ma First, Second, Third, Fourth, Fifth, Sixth, Seventh Eight and Nineth Batch Admission List for Pre-degree & Remedial programme for 2018/2019 academic session. 1. Find below the admission list for the 2018/2019 admission session for the School of Basic and Preliminary Studies (SOBAPS) 1ST Batch. 2. Find below the admission list for the 2018/2019 admission session for the School of Basic and Preliminary Studies (SOBAPS) 2ND Batch. 3. Find below the admission list for the 2018/2019 admission session for the School of Basic and Preliminary Studies (SOBAPS) 3RD Batch. 4. Find below the admission list for the 2018/2019 admission session for the School of Basic and Preliminary Studies (SOBAPS) 4TH Batch. 5. Find below the admission list for the 2018/2019 admission session for the School of Basic and Preliminary Studies (SOBAPS) 5TH Batch. 6. Find below the admission list for the 2018/2019 admission session for the School of Basic and Preliminary Studies (SOBAPS) 6TH Batch. 7. Find below the admission list for the 2018/2019 admission session for the School of Basic and Preliminary Studies (SOBAPS) 7TH Batch. 8. Find below the admission list for the 2018/2019 admission session for the School of Basic and Preliminary Studies (SOBAPS) 8TH Batch. 9. Find below the admission list for the 2018/2019 admission session for the School of Basic and Preliminary Studies (SOBAPS) 9TH Batch.